On this International Human Rights Day, we take the opportunity to remember the brave Libyan activist Salwa Bugaighis, who believed deeply in human rights, women´s rights and equality for all, and who paid the ultimate price for her convictions. 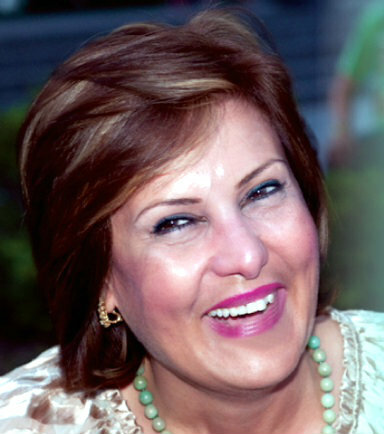 Salwa was one of the founders of the Libyan Women’s Platform for Peace, and played a very active role in the 2011 revolt against Colonel Qaddafi. Salwa was brutally murdered in her home in Benghazi on June 25, 2014, and many questions surrounding her death remain. Investigations into the murder are still ongoing. Salwa’s husband Essam Gheriani, who was kidnapped on the day of her murder, remains missing to this day. Despite the nascent peace process negotiations, Libya is still in the midst of a complicated and violent conflict that deeply divides the country and its people. An agreement signed last weekend between Libya’s two opposing governments might form the first step towards a solution, but many hurdles must be overcome before real peace is in sight. As our partner the Libyan Women’s Platform for Peace maintains, more than just an end to the violence and power struggle is needed in order to ensure a long-term, sustainable peace. In addition to important issues such as security, economic recovery and a broad reconciliation process, widespread impunity and the need for transitional justice must also be addressed. Salwa Bugaighis was just one of the many victims of the surge for power in Libya after the 2011 revolution. Every one of them deserves justice and accountability. In order to continue Salwa´s work and demand an end to impunity in Libya, the Libyan Women´s Platform for Peace has made a 30-minute film about her life, her death and her legacy. This film, Justice for Salwa is Justice for All, is part of a broader awareness campaign that started last year. It will be screened on national Libyan television today, as well as during several public screenings in – amongst others – Benghazi and Tunis. The film will be available online at a later stage, but these short clips are now available. In March 2015, Hivos, together with Equality Now and Karama, and in partnership with the Libyan Women’s Platform for Peace, lobbied the UN Secretary General and UN Security Council members to initiate an independent investigation into the assassination of Salwa Bugaighis and other women who were assassinated. We urged the Presidentof the General Assembly to prioritise the security of women leaders, women’s organisations and human rights defenders in the post-2015 development agenda. Hivos remains committed to this goal and continues its work with and support for the Libyan Women’s Peace Platform. On this important day, once more, we raise our voices to call for justice for Salwa, who represents the spirit of so many courageous women and activists in Libya who fell victim to violence. Justice for Salwa is Justice for All. Please get in contact with our Women on the Frontline programme if you wish to screen the full-length film and be a part of the campaign for change.